“The cheesy potatoes were baking as they recorded the commercial and mmmm, they smelled so good!” Jayme chattered excitedly to Mom. Then she stopped, suddenly seeing Mom’s fixed stare at Taylor. At that moment, Taylor smacked her forehead, “Oh! I should have just made the cheesy potatoes and brought them along to cook at Grandpa’s!” she groaned. Both Jayme and I looked at each other confused; until it dawned on me what they were talking about. “So that’s what you meant when you said we were bringing potatoes for Grandpa’s birthday!” I cried. “Yeah,” said Mom, “they were to be baked at Grandpa’s so they would be warm for supper.” Still Jayme did not grasp the situation, so Mom patiently explained to her why the cheesy potatoes should have been only made, not baked. I turned to Taylor and said, “Sorry Taylor, I didn’t realize you shouldn’t have baked them.” “It’s okay, but I wish I had thought about it before I cooked them,” she sighed, “But we need to get busy; we have yet to make cranberry sauce and a cake, not to mention doing the dishes from supper.” Wearily, we both got up from the couch in our family room and headed to the kitchen. Jayme came prancing into our room on her stick horse the next morning, saying “Wake up girls! It’s Grandpa’s birthday!” and galloped out. I groaned (while saying to myself “Next time Jayme, could you sing a song or something other than making your horse say, ‘I like it when you brush me!’”) and looked to see what time it was – more specifically how long it would take us to get out of the house. Then I cracked a smile and called down to Taylor from my top bunk, “At least the cheesy potatoes are made!” Taylor only groaned, rolled over, and threw her covers her head. Despite having a late start in leaving, we were finally all in the “Glory Bus” (or as Taylor has started to call it the “Adventure Bus”) on our way to celebrate Grandpa’s 71st birthday. “Isn’t it nice to be going down just to visit Grandpa and not having to pack suitcases and set up at a church?” remarked Taylor from across the aisle from me. Ben and I nodded as we bumped along down the road. We were about at the half-way point in our trip when Dad suddenly exclaimed, “Oh no! We have a problem! I’ve got to pull over, the engine is over-heating!” Unfortunately, we were in the middle of a busy highway during the lunch hour rush. In the next suspenseful moments, Dad slowed down and took several exits to get off the highway. To make matters worse, the roads we turned on were under construction! Finally, finding a gas station, we turned in – only to find all available parking spaces filled. Driving a little further, we found a nearly deserted parking lot; Dad pulled in. As the engine shut off, we all thanked God we had made it this far without the bus exploding into flames or maybe worse. Ben and Dad exited the bus to look around and see what was going on with our “whale on wheels”, while Mom took stock of the position we were in. Soon Dad and Ben came back in with what they thought was wrong. Dad thought that a hose was leaking coolant, thus causing the engine to over-heat. But a more careful inspection (I am so glad Dad is a mechanic) showed a belt almost completely demolished. This belt controlled the alternator, the water pump, and the fan, all necessary for the running of the engine. And this was beyond what Dad could do (he happened to leave his tools at home on this particular trip); we needed help. With the aid of his GPS, Dad began calling different auto shops to see if anyone in the vicinity could help. 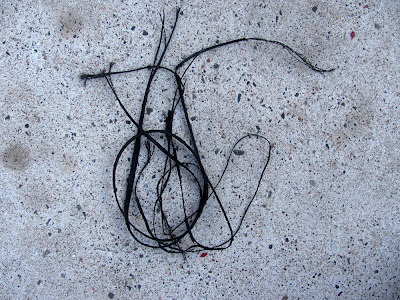 The shredded remains of the belt. It was around 12:00 p.m. when we stopped in the parking lot, and after the preliminary settling down, Mom suggested we all should have some lunch (we were all starting to get hungry) since it was looking like we weren’t going to make it to Grandpa’s any time soon. As I made my way to the back of the bus and saw the cheesy potatoes, I exclaimed, “Hey, maybe it was a good thing after all that Taylor made the cheesy potatoes! God knew we would need them today before we got to Grandpa’s!” Everyone agreed; the first blessing counted. “Well,” said Dad just getting off the phone with roadside assistance, “it’s going to be an hour and half wait until the mobile mechanic gets here.” “I’m going to walk over to McDonald’s to keep warm,” said Mom, “And this will be a great time to get those spelling tests done, Sam and Jayme, as we’re not moving. Anyone else coming in with me?” Taylor said she would also come, so Mom, Sam, Jayme, and Taylor set off across the parking lot. Dad, Ben, Caleb and I waited in the ever-getting-colder bus. Caleb, Ben, and I began reading books as the minutes ticked by. Suddenly Dad said, “They’re here!” All of us in the bus looked outside excitedly as a repair van pulled up beside our poor bus. We all hoped the repair man would fix it soon so we could either continue to go down and visit Grandpa or go home soon. Sam and Jayme came over and Ben, Sam, Jayme, and Caleb began playing games as the repair man, Jim, began trying to fix our bus. Soon he (and we) found out that the replacement belt was too short and would not fit. Then began the long process of finding another belt, waiting for Jim our repair man or some else to get a belt, and trying to make it work. Jim, the mechanic, discovered the tensioner for the belt was broken, so after another belt was picked up, we waited for that part to be fixed. But even after the tensioner was fixed, the belts we had didn’t work! In the end, Jim and another repairman moved the alternator to make one of the belts work. Meanwhile, all of us kids (with Mom) hung out in McDonald’s. Boy, I was never as thankful for McDonald’s as I was then. First, we sat around and chatted, but then we had the bright idea to play a game. We played one game for over an hour and got quite loud, so loud that Mom asked us to burn off some energy outside. 🙂 After walking around in the parking lot, we came back in not wanting to finish our game. Being supper time, we had gotten awfully hungry sitting in a restaurant. Knowing it would be rude to bring in our food to eat, Mom said we could eat off the dollar menu (our last concert we had been given money for a meal, and well, it came in handy!). As we were eating, Dad and Jim came in to get warm and wait for the last belts to arrive. Jim shared stories about going out to eat when he was young; how a cheese burger cost sixteen cents and a regular burger was fourteen cents. He told us of growing up in a family the same size as ours with eight kids. It was interesting to hear what life was like back in those days, before the age of technology. Around nine o’clock the bus lights went on (we saw through McDonald’s windows), and we knew the bus was fixed! We could go home! We cleaned up our school books, games, jackets, etc., at McDonald’s (we took up a lot of room, three booths!) and prepared to head out to the bus. First, we were not out in the middle of no-where, but still close enough to the Cities (as we Minnesotans call Minneapolis/St. Paul and their suburbs), so that we didn’t wait hours and hours just for someone to arrive. It had been a nice day, not snowing or raining. Also, we were near a warm place with bathrooms. We had food along (already baked!) and it was cold enough they didn’t spoil during our long wait. Another blessing was we had brought along games (more than we usually do) to play with Grandpa on his birthday. We were blessed with good mechanics who worked hard to fix our bus. God was watching over us; the bus didn’t break down on our way to a concert. And even though it was sad not being with Grandpa on his birthday, we were not really pressed for time. God had also provided for a meal at McDonald’s, and He brought us back home safely – all in one day! Also, because of the amazing generosity of a certain individual, we were overwhelmingly blessed to not have to pay labor charges (which were very large) – we only had to pay for the parts. All the way home, I was praising God for the good things He had done for us. Truly I could say with David: “Bless the LORD, O my soul, and forget not all His benefits.” What a time to be mindful of all the benefits of trusting in God! And how fitting that it was Thanksgiving week, a time set apart to be grateful for the abundance of our blessings so graciously given to us from a loving God.